Why Vinyl Siding for Today’s Designs? High-tech engineering, quality manufacturing and a focus on designing for diverse architectural styles are revolutionizing the way architects, designers, planners, developers, builders, remodelers and other building product specifiers regard vinyl siding for the houses they proudly create. More and more, these professionals are including vinyl siding prominently, on its own and in combination with brick, stone and even other styles of vinyl and polymeric siding. They have always highly regarded vinyl siding for its durability, low maintenance and value. What’s changed is that the improved aesthetic qualities and performance of today’s vinyl siding are now featured on upscale homes, as well as on homes at all price points, with style, creativity and confidence. Today’s vinyl siding, beautifully replicating the clapboard styles of yesteryear, is being made for a sustainable future. The strong traditions of the architectural styles and structures of the past are preserved in the materials we have today, with technological enhancements that provide long-lasting benefits beyond the aesthetic. 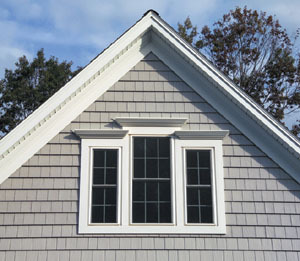 The historic traditions of clapboard-style architecture, including classically influenced styles such as Georgian, Greek Revival and Queen Anne, are easily and accurately specified using modern, low-maintenance technology—vinyl siding. What’s more, vinyl siding’s performance as a sustainable building material enables it to achieve points for certification in the leading green building standard programs. 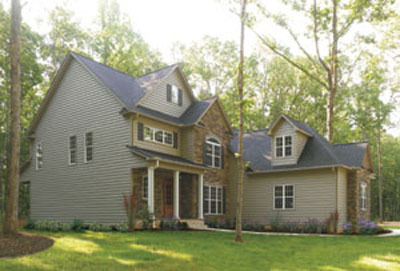 Vinyl siding is often used with other siding materials for a rich aesthetic design. The inspiration came from the early craftsmen who designed and built in Dutchlap and Victorian traditions. The innovation came with the ability to develop and produce a highly cost-effective, durable, aesthetically pleasing product. The result is today’s vinyl siding—the number one exterior cladding choice in the United States and Canada for new construction and remodeling. Vinyl siding was first produced in the late 1950’s at a manufacturing plant in Columbus, Ohio. The process was mono-extrusion, blending of colors was done manually, and early vinyl siding was little more than a replacement for aluminum siding. Early manufacturing processes made it difficult to produce and then install a consistent, quality product. In 1969, the first post-form vinyl siding was manufactured. A more scientifically engineered blended powder base—instead of the pellets that were used previously—resulted in a more durable and consistent end product and opened the door for the next generation of vinyl siding. And, because it mimicked other products that were not diverse in color or style, it is easy to understand how negative attitudes and perceptions about vinyl siding spread throughout the building community. Now that monumental advances in technology have taken place, those attitudes are woefully out of date and the perceptions of the past have been replaced with the beauty and variety of today’s vinyl siding. Vinyl siding use grew steadily because of the basic advantages it provided, including low maintenance, value and easy installation. The transformation of the product continued into the 1970’s and 1980’s, and it’s still evolving today. The vinyl siding industry has made numerous improvements in formulation that allowed the product to be produced faster, resist impacts and allow an unlimited range of colors. Co-extrusion, electronic color blending and smooth finishes without harsh light reflection were huge steps forward. Those improvements also led to the development of a wide range of truly decorative and stylish architectural trim and accessories. Inspired by the success of the vinyl window industry, more and more companies in the United States and Canada began adding vinyl siding to their manufacturing base. Helped by the pressures of competition and new technology, vinyl siding was beginning to beautifully replicate wood, without wood’s maintenance issues or high cost. Vinyl siding grew to become the number one exterior cladding for both new construction and remodeling, and retains that position today. 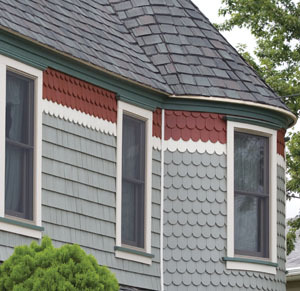 Options for profile design, colors, architectural trim and accessories continue to grow, and now vinyl siding can be used to achieve Victorian, Georgian, Craftsman or virtually any architectural style with elegance and attention to detail. Beauty, performance and durability are now givens among the United States and Canadian vinyl siding manufacturers. Since 1998, the VSI Product Certification Program, sponsored by the Vinyl Siding Institute and administered by Architectural Testing, Inc., has allowed manufacturers to certify with independent, third-party verification that their products meet or exceed the industry standard for quality—ASTM D3679. As a green product, vinyl siding is manufactured with virtually no waste, using a very energy-efficient process. In 2006 the program added third-party certification based on the standard for color retention of solid color vinyl siding, ASTM D6864, for vinyl siding products already verified to meet ASTM D3679. Certification based on the standard for multi-hued (variegated) vinyl siding, ASTM D7251, was added in 2008. There are more than 950 certified products, and nearly 350 vinyl siding colors certified for color retention. Since 2005 the VSI Certified Installer Program has trained and tested experienced vinyl siding professionals on proper installation techniques, consistent with ASTM D4756. More than 4,000 vinyl siding installers have been certified through the program, with more being added every month. To meet today’s environmental challenges, vinyl siding is engineered for sustainability. Vinyl siding manufacturing is an extremely efficient process with virtually no manufacturing waste. With modest amounts of energy used in manufacturing and in transporting such a lightweight material, vinyl siding contributes significantly less to global warming than many other cladding products. And it outperforms most other cladding materials, including brick, in almost all of the scientific performance criteria in recent analysis using Building for Environmental and Economic Sustainability [BEES] software, a life-cycle analysis tool developed by the National Institute of Standards and Technology (NIST). BEES is established per ISO 14040 and ASTM standards. The use of life-cycle assessment tools for selecting more environmentally preferable products contributes points toward green building practices in the ANSI approved ICC 700-2008 National Green Building Standard™ developed by the National Association of Home Builders [NAHB] and the International Code Council [ICC]. In addition, vinyl siding is a durable, long-life product. NAHB has cited “lifetime” as the estimated life expectancy of vinyl siding on a home in its “Study of Life Expectancy of Home Components” [February 2007]. Such durability is a key component of sustainability. In the next 50 years and beyond, one can be confident that more architects, designers, planners, developers, builders, remodelers and other building product specifiers will discover and apply the beauty, durability and quality of vinyl siding. The vinyl siding industry wants to continue helping to create innovative, sustainable communities for future generations, and to help support this effort, the Vinyl Siding Institute, Inc. (VSI) developed “Designing Style: A Guide to Designing with Today’s Vinyl Siding”, a resource for designing with and/or specifying vinyl and polymeric siding, architectural trim and accessories. VSI believes the most effective way to communicate the breadth and depth of products available today, and the creative, limitless possibilities for design, is by example. In “Designing Style,” VSI included many photographs and illustrations plus information to help create specific architectural style. 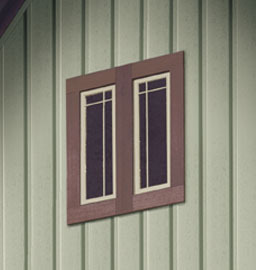 A PDF of this guide can be downloaded for free at www.vinylsiding.org/design. One of the chief advantages of today’s vinyl siding is that onlookers may not realize that what they’re seeing is made of vinyl. With so many contemporary products that mimic the traditional look of wood or stone, there’s very little difference in curb appeal between vinyl siding and its many competitive materials. Although many years ago vinyl siding had a poor reputation for looks and performance, those days are long gone. To clear up further misconceptions about today’s vinyl siding, the EHT staff turned to the experts at the Vinyl Siding Institute and spoke to VSI President and CEO, Jery Huntley. These days, “green” is the go-to word for many building materials, and Huntley points out that while some siding manufacturers may market their product as “green,” vinyl siding has the facts to back up its claim of environmental friendliness. “I don’t think the green message has been understood. Vinyl siding has been scientifically proven to be greener throughout its life-cycle than even we expected, which is why we provide those facts for the public.” Huntley explains that from its initial manufacturing process which creates virtually no waste to its light weight for easy transport, vinyl siding is truly an environmentally preferable siding option. “Vinyl siding is also the only exterior cladding with product certification and certified installation programs,” adds Huntley. Certified installation sounds very promising, but EHT was curious about what she thought of “uncertified” do-it-yourself installation of vinyl siding. VSI’s official installation manual is available to the public as a free, downloadable PDF. 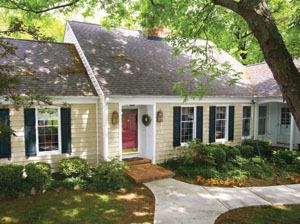 To download the manual and to take advantage of all sorts of other vinyl siding resources, visit www.vinylsiding.org.